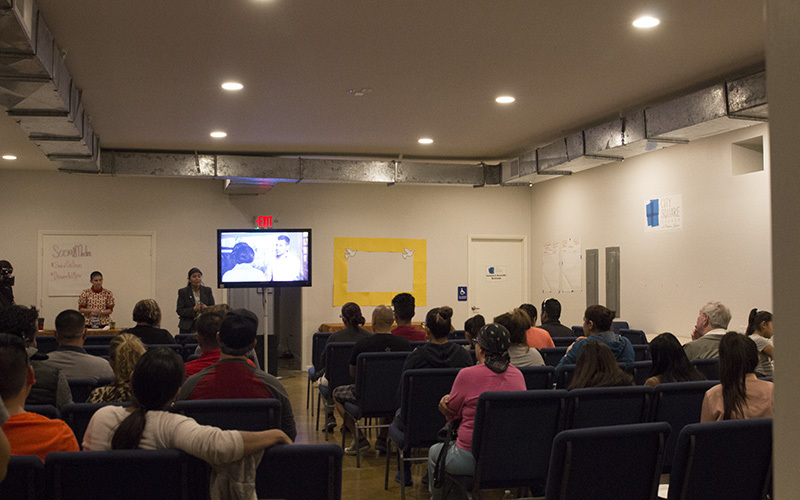 PHOENIX – Immigrants enrolled in Promise Arizona’s English-learning program gathered Tuesday night at its State of the Union viewing event. Women held their children and men crossed their arms as they all gave President Donald Trump their undivided attention, anxiously waiting for the president to touch on immigration. Midway into his speech, a number of reactions were visible on the faces of those watching as Trump announced his plans on the future of DACA, intensifying border security, and ending both chain migration and the visa lottery. State Rep. Tony Navarrete, a democrat who also serves as deputy director of Promise Arizona, watched with the families in the room. “I think the reason we’re coming here today is we want to be in solidarity, and to remind ourselves, as the community, that we have a lot of work to do,” Navarrete said. At one point in his speech, Trump spoke about MS-13, or Mara Salvatrucha, in relation to immigrants and the crimes they commit in the United States. MS-13 is a criminal gang mainly comprised of Salvadorans that started in Los Angeles in the 1980s. In regard to Trump’s MS-13 reference, Navarette said immigrants need to get the message across that they are not criminals. “Immigrants actually commit less crimes than the (native-born) American population,” he said. According to the National Bureau of Economic Research, immigrants actually have lower relative incarceration rates than those who are born in this country. Laura Perez, a volunteer at Promise Arizona, said Trump’s speech characterized immigrants as criminals, something she’s been seeing for the past year. “Stating that they hurt the American people, (is) just very inaccurate,” Perez said. What made Perez hopeful was the unity she saw among the adults who watched the address. Hateful was the word Navarrete used to describe Trump’s administration during his first year in office. “It felt like a very hateful administration. There’s been a lot of targeting of immigrants,” he said. Navarette said “Dreamers,” in particular, are being taken advantage of. “My initial reaction to Trump’s immigration announcement at the State of the Union was that he (is) using young people, these young “Dreamers,” as a hostage for him to get his money for the border wall,” he said. Rolando Lara, who attended the event, also believes the “Dreamers” are being used unjustly. “The president shouldn’t set those types of conditions,” Lara said. “‘Alright, let’s make these ‘Dreamers’ citizens in exchange for the money for a wall and the removal of chain immigration and the visa lottery.’ That, to me, is wrong,” he said. Lara’s ultimate takeaway from the speech was that immigrants need to continue to work and organize themselves. Despite what Navarrete referred to as attacks on civil liberties and American and family values during Trump’s speech, he said something good did come from hearing the president speak. “I think what is promising, even after hearing his speech tonight, is there’s group of individuals all across the country that are dedicated to making sure that America remains a place of dreams, America remains a place for opportunities, but at the same time that dignifies and respects other people as well,” Navarrete said. As an elected official, Navarrete said his job is to fight on behalf of immigrant families, and he promised to continue the fight. “I’m going to (make) sure we’re treating these individuals as humans and not dehumanizing them in the process to get a wall, to get money for additional border security that’s going to cost the country $25 billion,” he said. Have a story idea? Email us at [email protected].